Thirty years on, what does the Narmada Bachao Andolan teach us? Irony can never be so ironic. As the country debated the land acquisition, rehabilitation and resettlement bill, both in and outside Parliament, and the issue emerged as the Narendra Modi government’s biggest parliamentary and political challenge, there was another related landmark moment that hardly got any attention. The struggle against the Sardar Sarovar dam on the Narmada river, that came to be popularly known as the Narmada Bachao Andolan (NBA), completed 30 years. Arguably, the NBA woke up the country to the regressive and inhuman approaches to resettlement and rehabilitation policies for project-displaced people. Since the early 1940s, there had been plans to use Narmada water to generate electricity and create irrigation potential through a series of dams. The Sardar Sarovar dam, the last in the series just before the river flows into the Gulf of Khambhat, has been the most contested one. From here, the NBA started its struggle, hogging national and international attention. For popular movements like the NBA, 30 years are a long time to sustain, and to be still relevant. There are many things that have changed, or have not changed, since 1985 when the NBA started its protests against the dam project. For example, India got its first land acquisition law since independence in 2013. But more than this, to the country in general, and the policy makers in particular, the movement needs to be re-learnt, as land acquisition, resettlement and rehabilitation are contemporary, politically-charged issues. The NBA teaches us a few fundamental lessons on how civil society groups and governments should deal with pressing public issues. The movement didn’t happen overnight due to a singular anti-dam ideology. Rather it evolved. To start with, many in the movement were not staunch anti-dam activists. It was after much internal strife that the NBA assumed an anti-dam character. Why did it happen? The government, to begin with, never acknowledged the issue, and as usual, tried to portray it as an anti-development and anti–agriculture movement. 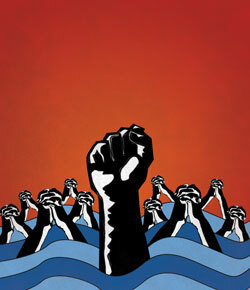 Consequently, the protesting communities hardened their stand that ultimately became anti-dam. So, the first lesson for both government and non-government agencies is to pro-actively respond to people’s grievances. The government didn’t listen, so it ended up facing a strong anti-dam protest. The NBA, not becoming very ideological in its approach, evolved to become a credible anti-dam platform. This lesson needs to be learnt as there are many NBAs now. For civil society groups, the NBA is an interesting case study in evolution. There is no doubt that the movement has given us a large number of dedicated environmentalists and activists who have been playing a critical role in the protection of the environment and human rights. In many ways, the NBA organised various civil society groups into a strong united force to work as a watchdog for environmentally threatening big projects. This gave civil society groups much political traction to push for changes. But, the lesson from the NBA is that one shouldn’t abandon its focus and the core principle of engagement. The NBA leaders are now lending their support to almost all issues of concern. They spend substantial time outside the struggle against the Sardar Sarovar Dam, as the Supreme Court has virtually become the only place of engagement with this core agenda. This has alas reduced the credibility of the leaders. During the last general elections, many of the NBA’s founding members opted for electoral politics. It is no secret that the NBA never approved this type of public engagement. In a polarised atmosphere where every concern for environment is taken as a war against ‘development’, this further questions NBA’s credibility. Analysts say that after the political plunge, there is a perceived decline in popular support for the NBA, even though the sympathy for the dam displaced people remains intact.